Aconite or Aconitum also known by many other names like Monkshood is a genus of over 250 species of flowering plants belonging to the family Ranunculaceae. These plants are mainly natives of the mountainous parts of the northern hemisphere, growing in moisture retentive but well draining soils on mountain meadows. 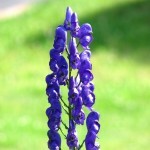 In homeopathy, Aconite is a commonly used remedy and is known to be a short acting remedy. There are many acute illnesses that can be stopped early in their tracks if Aconite is administered early in their onset. Definitely a remedy that should be part of any self-help set.